Baby it’s cold outside… and that means, it’s the season for soup! We’ve posted a chicken noodle soup on this blog before, but nothing quite hits the spot like Vietnamese miến gà, a glass noodle chicken soup just like my parents used to make for me when I was sick. Martin’s mom did the same for him and I’ll bet many Asian families have a similar recipe in their repertoire. It’s warm, comforting, and beautiful in its simplicity. 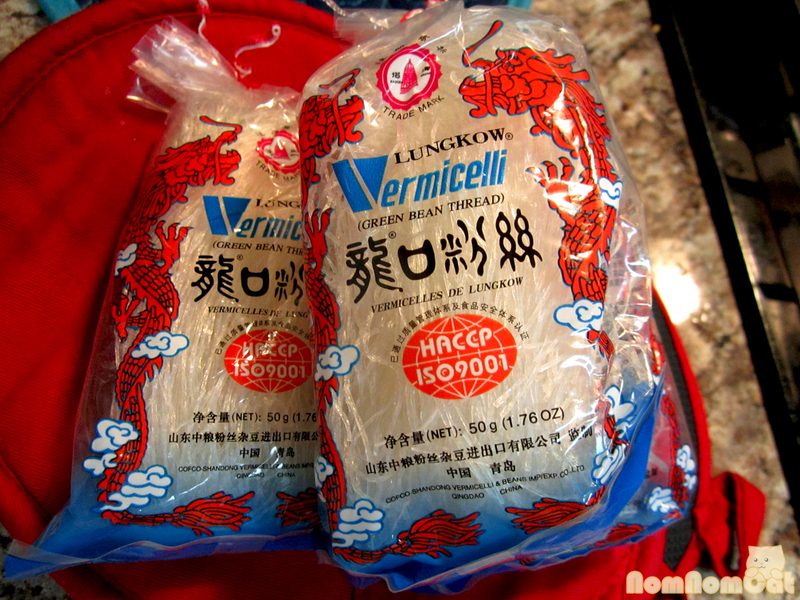 You could even increase the noodle-to-soup ratio to create the traditional Hawaiian dish Chicken Long Rice. Since we’re starting with just the basics here, the possibilities are endless. NomNomCat Tip #1: What I refer to as bean thread noodles (or bún tàu) are also translated as “cellophane noodles” or “glass noodles.” These are thin strands often dried and packaged in individual bundles about the size of a generous handful. 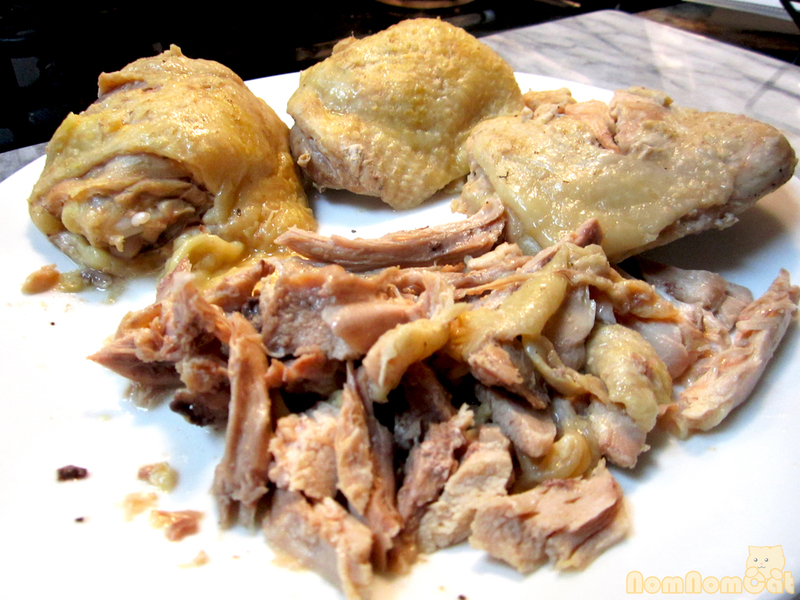 I cook them directly in the chicken stock, but you can boil them separately in water instead. The latter technique will make it easier to store leftovers (if you can avoid it, do not store the noodles together with the soup or they will quickly soak up all the moisture and expand). 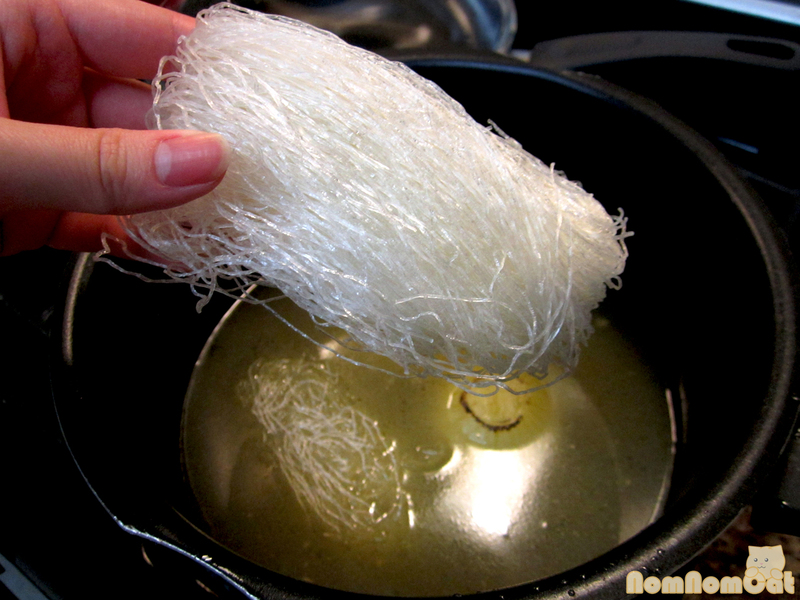 Note that these bean thread noodles (made with mung bean starch) are not to be confused with hủ tiếu dai, another Vietnamese glass noodle that is chewier and thicker in diameter, nor with bún, a rice vermicelli that turns bright white when cooked. NomNomCat Tip #2: Anyone who has been to a Vietnamese restaurant may have noticed that there is a vast difference between fish sauce straight from the bottle (nước mắm) and fish sauce that has been “prepared” so to speak (nước chấm, literally “dipping sauce”). 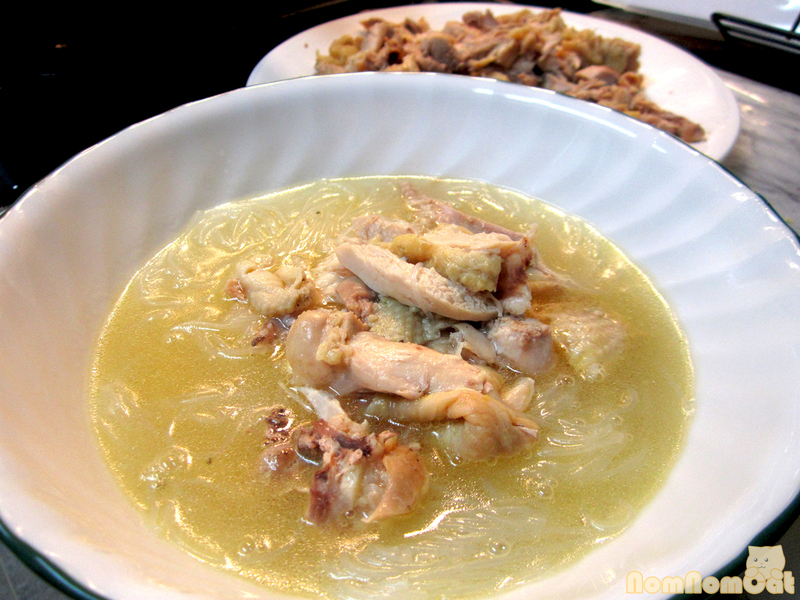 I use nuoc mam for seasoning the soup, but for the shredded chicken, the more subtle and balanced nuoc cham is in order. It’s easy to prepare and keeps well in an airtight jar in the refrigerator. Here’s an approximation of my dad’s recipe: In a small sauce pan, bring 1 cup of water to a boil. Stir in a scant 1/4 cup of sugar. When completely dissolved, add 1 cup of cold water to cool the solution down. 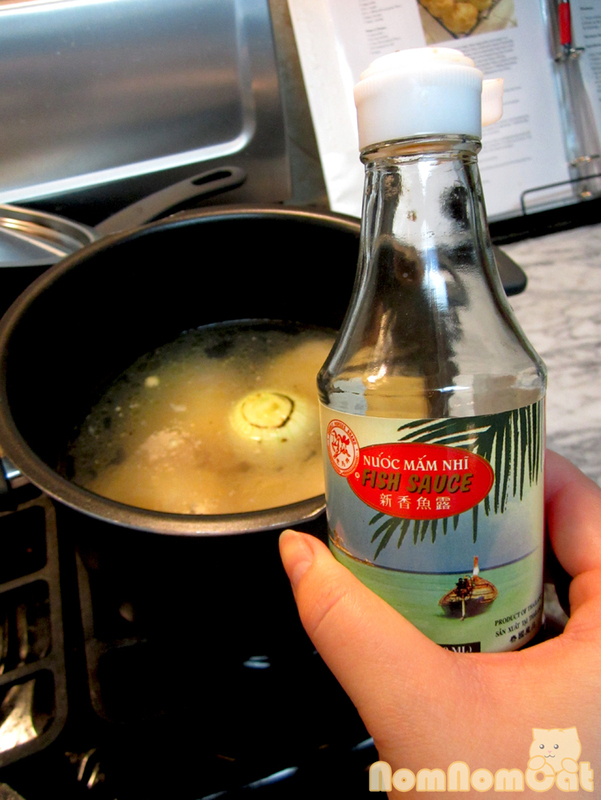 Add 1/4 teaspoon of salt, 2 teaspoons of nuoc mam (full strength fish sauce), and 1 teaspoon of white vinegar. Distilled will work fine but if you can get your hands on the Filipino cane vinegar (sukang maasim), Datu Puti is my dad’s brand of choice. Taste and adjust as needed. It should be a balance of sweet, salty, and tart. Pour into a jar and add a few thick slices of fresh garlic. The flavors develop better as it “ages” but you can also use right away if needed. Okay, now that all that is squared away, let’s go back to basics with miến gà. 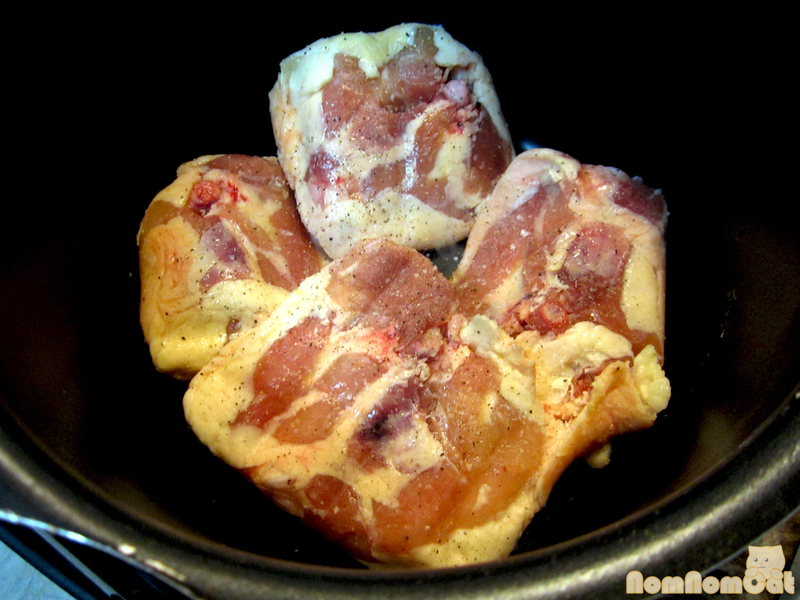 In a large pot (I think mine is a 5 quart stock pot), brown the chicken thighs (sprinkled with salt and pepper) skin side down on high heat to render the fat. Meanwhile, char the onion. To do this, you’ll need three things: a peeled onion, a burner on your (gas not electric) stove, and a pair of metal tongs. Oh and a bit of courage. Turn on the burner to high heat. Hold the peeled onion, gripping firmly with the tongs. 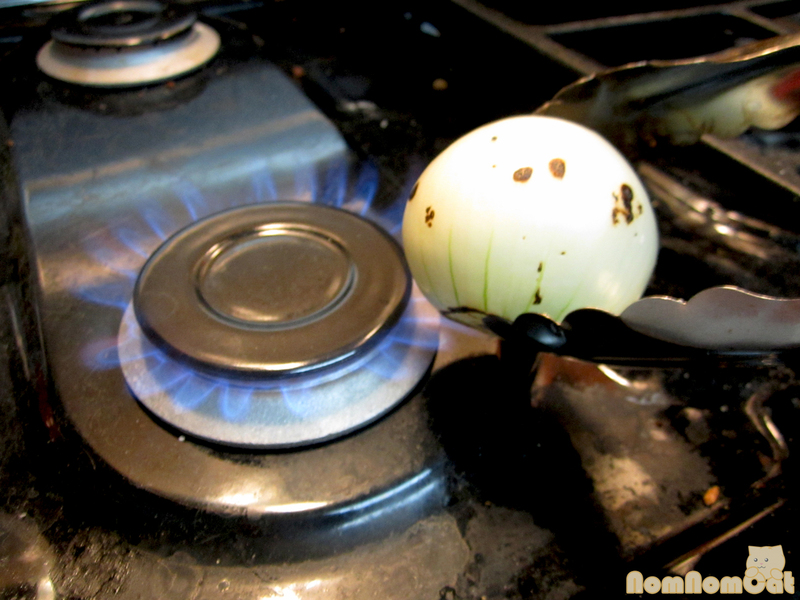 Lower the onion as close to the burner as you can stand it, letting the flames envelope the outer layers. Rotate the angle to evenly toast up the onion. Some patches may bubble up and pop — that’s where the courage comes into play. After I browned the exposed areas, I lay the onion onto a cutting board and re-position the tongs to char the hard-to-reach portion. Season with a few good shakes of fish sauce, about 2 tablespoons. 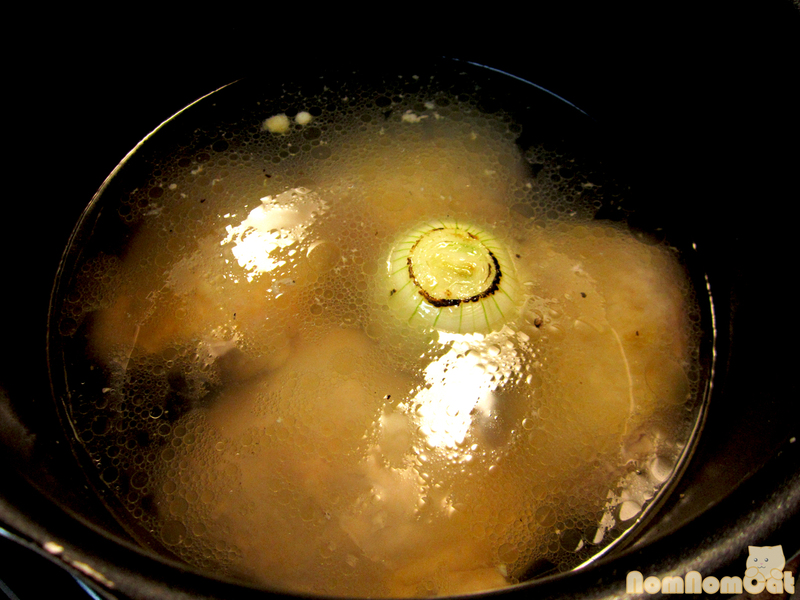 Let simmer for about 45 minutes to one hour or until the chicken has cooked through and the broth is fatty and flavorful. Remove the chicken to a plate and shred. It’s quite hot so I used a fork and knife. 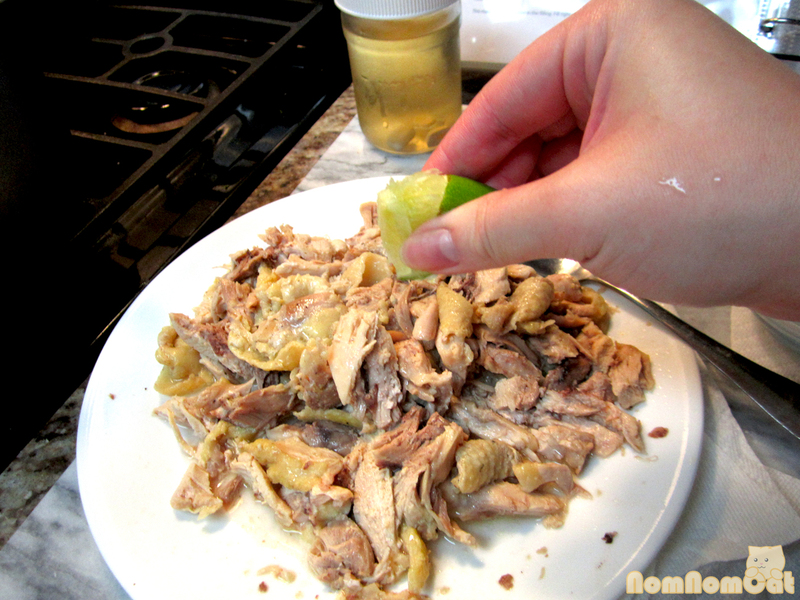 After all the chicken is shredded into bite-sized bits, I help it out a bit flavor-wise with a generous drizzle of prepared fish sauce (nuoc cham) and squeeze of fresh lime juice. Meanwhile, turn off the heat and add the bean thread noodles to the broth (or to a separate pot of boiling water, if desired). The bundles will expand and soften within minutes. To serve, grab a bowl. 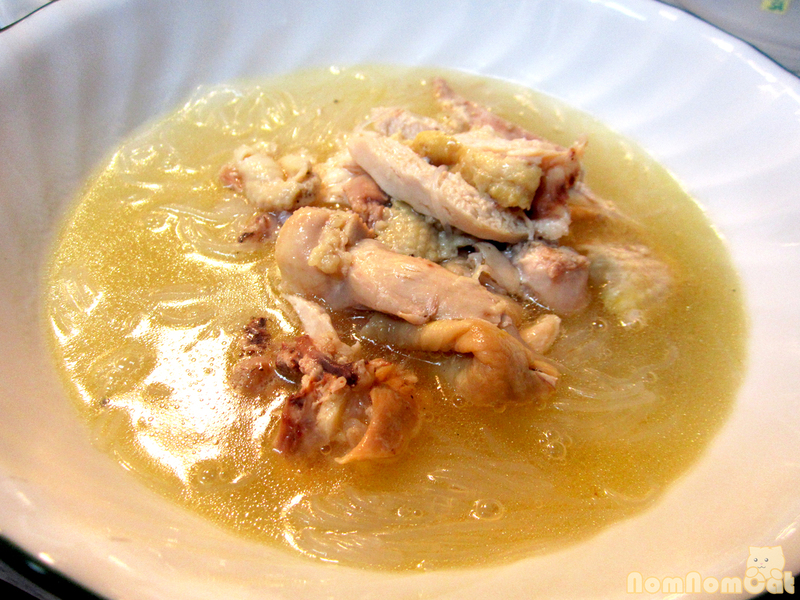 build a nest of noodles, pile on the shredded chicken, and ladle in the broth. Ladle in the broth and serve! Serve with a wedge of lime and, if you like a spicy kick, add a dollop of sambal oelek (chili garlic paste). This will yield about 4 servings. Enjoy! I am going through and uploading PRINTABLE versions of our recipes for your viewing and printing convenience. We love to post step-by-step photos along with our recipes, but we know that this makes for cumbersome print jobs when it comes to bringing a copy of the recipe into the kitchen for reference. 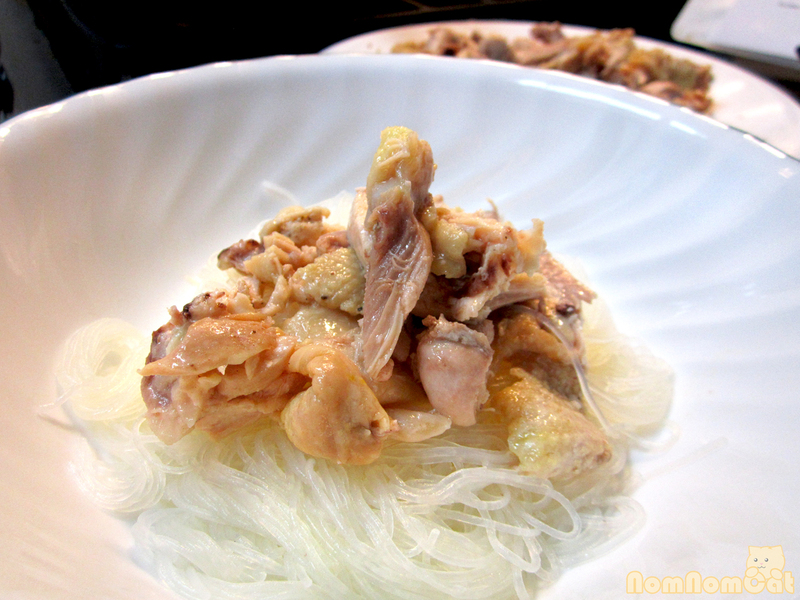 For this mien ga recipe, please click on this link or the BRAND NEW BUTTON below. For our recipe archive (a work in progress), click here. Scroll down to the very bottom of the site, click on “Print Page,” and when prompted, either save as a PDF to your computer or send the print job directly to your printer. Easy peasy!